Remind me to give you the story one day of how my husband and I put together our super-budget wedding. And when I say budget, I actually mean it. Not like when Jessica Simpson says it. Anyhow, I refused to spend money on a few things that I knew for certain I could do myself. A $35 unity candle? No way!!! A $5-or-less, 5-minute unity candle that looks less cheesy? Yes, please. This is all you have to do. Find a little modern-day version of the dime store. The Family Dollar would probably suffice. We found this little local party wholesale store. 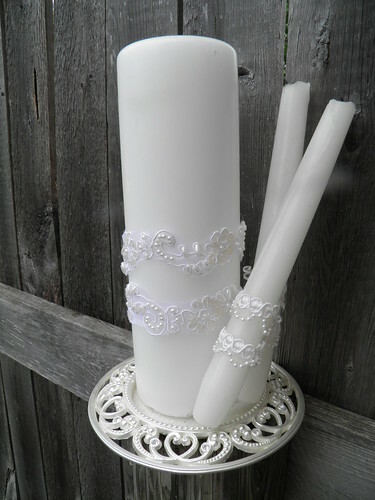 Now, find a large white pillar candle and two tapered candles. You might even look for a nice candle stand while you're at it. Even the dollar stores have some candle holders that would work. Then, head to your local craft store and find some pretty lace. I picked a beautiful strand for just pennies. 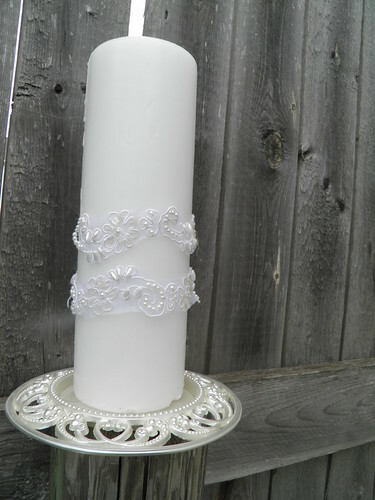 Wrap the lace around the candle and hot glue in place. I wrapped two strips of lace around mine because it was so delicate. Do the same with the tapered candles. Ta-da. Insta-unity candle without the outrageous price tag. Because I knew that the candles would only be lit for a few minutes, I wasn't worried about burning up the lace. However, if you do plan on using the candle later, you might want to take that hazard into account.